A wedding should be a day to remember. Once the vows have been said and the celebration begins the wedding cake becomes a focal point for the festivities. The ritual of cutting and sharing the cake unites bride, groom and guests, and so the cake should be something for everyone to enjoy. A wedding cake coated in smooth, pure white ready to roll icing is traditional, but now people are increasingly opting for wedding cakes that have more flamboyance or perhaps reflect more of the couple’s personalities. A simple option is to decorate the cake with a coloured ready to roll icing and add some decorative flourishes. You’re not straying too far from tradition, but adding a nice twist to the familiar. 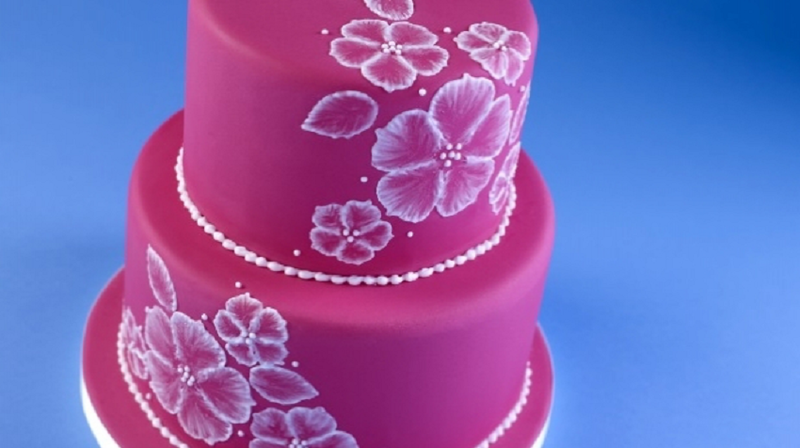 This simple recipe makes an exciting pink ready to roll icing wedding cake. A successful marriage is built on a solid foundation, and the same applies to the wedding cake. A sponge ensures the cake isn’t too heavy and stodgy, but gives the cake a classic flavour. Before you begin combining your ingredients preheat the oven to 180oC or 350oF. Grease and line four 6-inch round cake tins and four 8-inch round tins. Put them to one side. Take a large mixing bowl and add your butter and caster sugar. Cream them together until the mix is smooth then add in your vanilla extract and combine. At your eggs one at a time, including a spoonful of flour between each one. Fold them into the mixture making sure everything is well combined before adding the next egg and portion of flour. Carefully fold in the remaining flour and corn flour. Once the mixture is smooth add 18-20 tablespoons of milk. Once the mix is ready divide it evenly between the lined tins. You’ll need to bake them in two batches. Each one should take about 25 minutes. Check the cake is ready by inserting a skewer into the middle. If it comes out clean the cakes are ready. Leave the tins on a wire rack for 10 minutes to cool, then turn out onto the rack and leave to cool completely before decorating. You’ll need buttercream to fill and coat the cake before icing it. Beat the butter in a large mixing bowl until smooth and light. Combine the icing sugar, then add the milk and vanilla essence. Beat until smooth. Cut the top off each cake with a sharp knife to give you a flat surface. Use half of your buttercream and the raspberry jam and sandwich the four 6in cakes. Do the same for the 8in cakes together. Cover both cakes with a thin layer of buttercream. Knead your pink ready to roll icing until pliable. Dust your work surface with icing sugar, then roll out about 250g of the pink ready to roll icing and cover a 10 inch cake drum, smoothing the edges with your fingers. Re-dust your work surface if needed then roll out your ready to roll icing. Place the 8-inch cake on the iced cake drum. Using your rolling pin to support the icing roll it over the cake and smooth down the sides with the palm of your hand. Cut away any excess icing from the bottom and then smooth the icing with smoothers or your hands. Repeat the above to cover your 6-inch cake. To stack the caked insert four plastic cake dowels into the centre of the cake. Be sure to evenly space them so they support the top cake. Cut them to length and then position a 5-inch cake board on top. Gently stack the smaller cake onto the larger one. Use a flower cutter and a leaf cutter to emboss the outline into the pink ready to roll icing. In a mixing bowl beat your egg whites and icing sugar together until you get a soft peak consistency. Fill a piping bag half full with your royal icing mix. Use a number two tube to pipe out the border. Keep the tip of your piping tube at a 60 degree angle and pipe tear drops of icing around the base of both cakes. To create the floral patterns, pipe around one petal edge at a time. Dip a paintbrush into some cooled, boiled water then dab onto the paper towel. Use the damp paintbrush to stroke the royal icing across the flower. Finally pipe a couple of dots of icing into the centre of the flowers. And that’s it. One simple, elegant and eye-catching wedding cake which uses Renshaw ready to roll icing and some simple embossing and decorating techniques to make it really special. Did you bake your own wedding cake or did you leave this job to the experts? This is a promotional post with images from christianbed.com and Renshaw.